Stockport has played a pivotal role in the textile industry of the United Kingdom. Firstly it was silk throwing. In the early 18th century, England was not capable of producing silk of sufficient quality to be used as the warp in woven fabrics. Suitable thread had to be imported from Italy, where it was spun on water-powered machinery. In about 1717 John Lombe travelled to Italy and copied the design of the machinery. On his return he obtained a patent on the design, and went into production in Derby. When Lombe tried to renew his patent in 1732, silk spinners from towns including Manchester, Macclesfield, Leek, and Stockport successfully petitioned parliament to not renew the patent. Lombe was paid off, and in 1732 Stockport's first silk mill (indeed, the first water-powered textile mill in the north-west of England) was opened on a bend in the Mersey. Further mills were opened on local brooks. Silk weaving expanded until in 1769 two thousand people were employed in the industry. By 1772 the boom had turned to bust, possibly due to cheaper foreign imports; by the late 1770s trade had recovered. The cycle of boom and bust would continue throughout the textile era. On 21 July 1784 Samuel Oldknow, arrived in Stockport and bought a house and warehouse on Hillgate, he gave out 530 lengths of cotton warp to the local hand loom weavers who returned the woven pieces, these he traded through a London agent. This was the Putting-out system that survived in weaving long after the factory system was normal for spinning. To obtain yarn he opened a mill in 1791 at the Carrs, on the Tin Brook and a large mill at Mellor. The combination of a good water power site and a large female and child workforce used in textile factory work meant Stockport was well placed to take advantage of the phenomenal expansion in cotton processing in the late 18th century. Warren's mill in the market place was the first. Power came from an undershot water wheel in a deep pit, fed by a tunnel from the River Goyt. In 1796, James Harrisson drove a wide cut from the Tame which fed several mills in the Park. In 1786 Henry Marsland gained water rights to erect another mill adjacent to the Park silk mill which he already owned. The two Carrs silk mills had converted to cotton before 1785, and the larger silk mills such as Park and Logwood followed. Hatmaking was established in north Cheshire and south-east Lancashire by the 16th century. In the early 19th century the number of hatters in the area began to increase, and a reputation for quality work was created. The London firm of Miller Christy bought out a local firm in 1826, a move described by Arrowsmith as a "watershed". By the latter part of the century hatting had changed from a manual to a mechanised process, and was one of Stockport's primary employers; the area, with nearby Denton, was the leading national centre. Support industries, such as blockmaking, trimmings, and leatherware, became established. The First World War cut off overseas markets, which established local industries and eroded Stockport's eminence. Even so, in 1932 more than 3000 people worked in the industry, making it the third biggest employer after textiles and engineering. The depression of the 1930s and changes in fashion greatly reduced the demand for hats, and the demand that existed was met by cheaper wool products made elsewhere, for example the Luton area. Wellington Mill was built in 1830 by Thomas Marsland (1777-1854) whose wealth was founded on a major calico printing concern in Stockport. His father John Marsland (1749-1811) established a dyeing business in the early 1780s. He was mayor of Stockport in 1803. Thomas entered the business producing a blue-dye and Turkey red then moved into calico printing which was described by Baines as the largest in Europe. He had print works on Daw Bank and on Chestergate. The Manchester and Buxton Trust opened the turnpike called New Road (now Wellington Road) in 1826. Marsland acquired the 4,812 square yards (4,023 m2) of land between his printworks and the turnpike to build the mill. When completed the building was occupied by a partnership between Marsland and two of his sons-in-law, Richard Hole and Alexander Lingard. When the business was established in 1834-6 he removed himself from the partnership and a third son-in-law, William Courteney Cruttenden joined the firm. In 1851, Richard Hole was bought out. Lingard's share passed to his son John Marsland Lingard on his death in 1860 and by 1870 John Marsland Lingard was the sole occupier. In 1872 he leased the building to John and George Walthew a spinning and doubling sewing cotton firm. In 1895 the executors of Lingard and Cruttenden sold the mill to Ward Brothers, hatters. The 200 feet (61 m) chimney was added in 1860. Hat Works has a good collection of twentieth century British hats, including top hats, bowler hats, trilbies, homburgs, 1950/60’s ladies synthetic hats, and all kinds of hats dating from the 1930s to the 1970s. To complement the museum’s existing collection, Hat Works are currently concentrating on collecting hats made before 1900, hats from other countries, and hats made by modern designers. Hat Works’ ground floor provides an introduction to fur felt hat-making, which began to concentrate in the Stockport area from the 17th century. A farmer, making hats to supplement his income, is shown preparing fur to be shaped into hats. Hat Works introduces mechanisation of the hatting industry to its visitors with a hatter’s cottage. Visitors can walk through the back kitchen of a small terraced house to see how a worker in a hat factory might have lived in the late 19th century, when hatting became an urban occupation. One of the most atmospheric parts of the museum is the recreation of a hat block maker’s workshop and office. 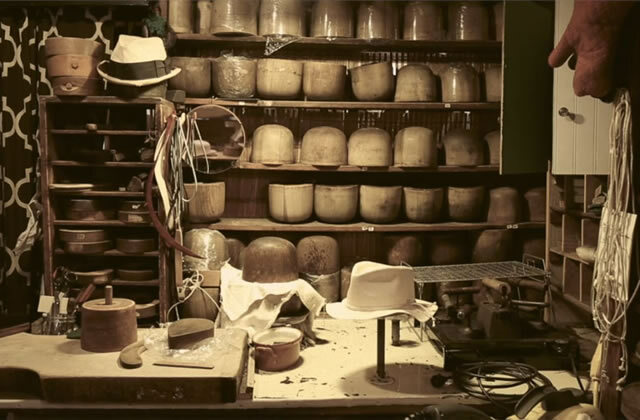 Wooden hat blocks around which to mould hats were essential to the hat maker. 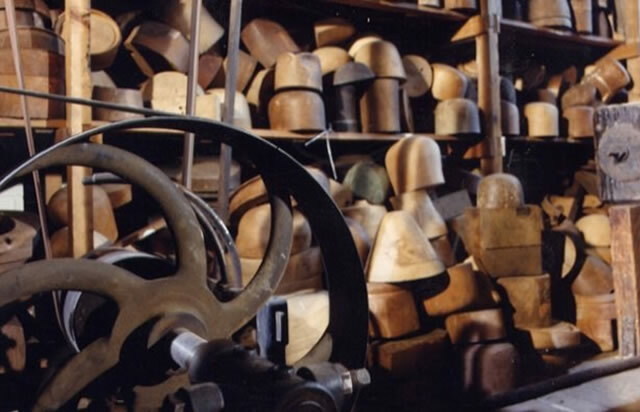 William Plant and Co. of Great Ancoats Street in Manchester were the last hat block makers in the North of England. When they shut down in 1976, the contents of their workshop and office were painstakingly removed, and are now on display at Hat Works in an accurate recreation. A labyrinth of lathes with a web of leather driving belts still function, and the old-fashioned office, complete with desk diary and cigarette packet, is in as much orderly chaos as it used to be. In the 19th century, when Plant’s business began, it used steam power to drive the lathes and block-copying machines. Visitors can see the kind of engine that was used: a magnificent Tangye steam engine is kept in good order, and is working under electric power. Admission Price includes a Hat Works guided tour. If you wish to visit without the tour then it is Free. The museum is wheelchair accessible and the tour guide will give detailed information for the visually impaired. Location : Hat Works Museum, Wellington Road South, Stockport SK3 0EU. Transport: Stockport (Arriva, Cross Country, Northern, East Midlands). Bus routes 22, 358, 364, 372, 374, 378 and 383 stop nearby.